issued a sombre warning to his kidnappers. If Christmas is a time for counting your blessings then it’s doubly true for charity worker and doting mum, Moira Kelly. She sits beneath the giant tree at her Victorian farm, watching her world famous charges studying their reflections in the brightly coloured baubles. I'm Megan Norris, freelance writer, author and journalist with over thirty years experience supplying exclusive headline stories to the national magazines and TV media. 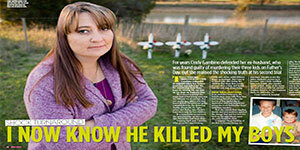 For years Cindy Gambino defended her ex-husband, who was found guilty of murdering their three kids on Father’s Day. But she realised the shocking truth at his second trial in 2010. In 2007 the shattered mum Cindy Gambino collapsed in anguish when her former husband was jailed for life for murdering their three boys by driving his car into an icy dam on Father’s Day. The sad, vacant eyes and battered face of abused tot Daniel Valerio stares out from faded newspaper cuttings, capturing a brief, fear-ridden life that culminated in his brutal death at the hands of his stepfather more than 20 years ago. Christmas is a time for miracles, and Melbourne mum Rebecca Samarias is convinced a guardian angel watched over her when she survived the 2004 Boxing Day tsunami that swept away her dream Sri Lankan honeymoon. 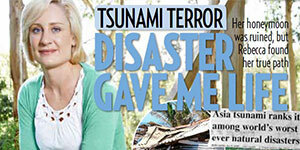 While the disaster could have stolen her spirit, instead it set her on a lifelong path to help others. Nothing was going to stop breast cancer survivor Deborah De Williams from running 18,026 kilometres around Australia to raise funds for breast cancer research. Her initial attempt was abandoned – but only after running the last 825 kilometres on broken feet.Told she would never run again, Deborah went on to prove everybody wrong, drawing her inspiration from a dying young breast cancer battler. 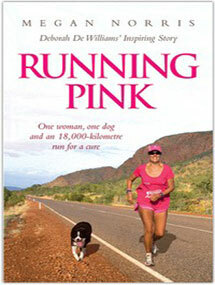 I was proud to launch a book about a truly inspiring Tasmanian, Deborah De Williams – Running Pink. 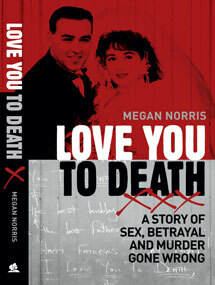 Written by Megan Norris, Deborah’s story is one of hope. The hope Deborah has given to others and those who gave her hope when she needed it most after being diagnosed with breast cancer. Copyright © 2013 - Newscoop - All rights reserved. Stay Connected Follow me on your favorite social networks.